December 8, 1978 - In. Tel Aviv, it's late afternoon, Friday, December 8th, 1978. The Israeli populace is just getting word: Longtime leader Golda Meir is dead. Hear an interview with News Director Jim Gordon, and relive how WNEW news sounds in 1978. 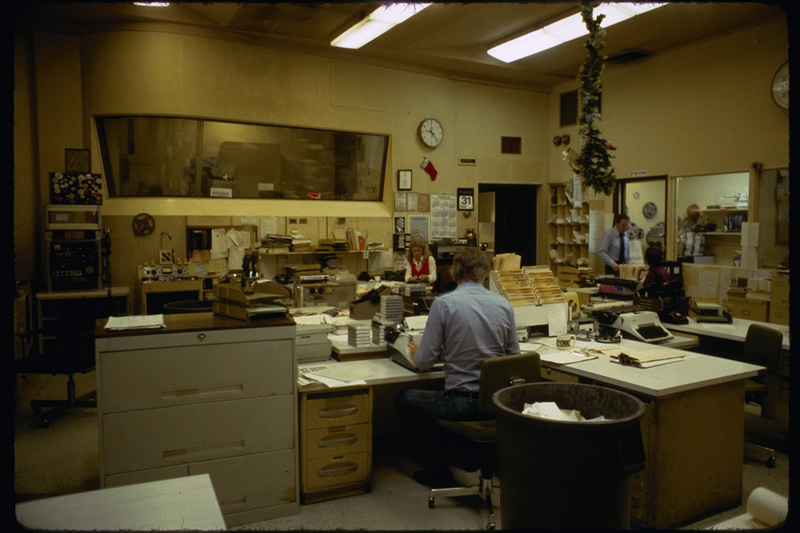 In New York, it is still morning... Over at the King's County courthouse, WNEW reporter Peggy Stockton is trying to file a story. A senior citizens' organization is assembling at that borough court. The members are protesting the mugging of two older Brooklyn women. They are there to ensure that "justice is done," to the one accused perpetrator. Stockton has spent an hour gathering about fifteen minutes' worth of lively tape. There is a policeman, discussing the sickness of the city. And how most of the crime takes place during the day. And how "kids" in Brooklyn prey on older people. There is a woman, who tells the story of her lost wedding ring: how a thief, holding a knife to her throat, threatened to cut her finger off if she did not hand it over. There are others, relating how frightened they are to walk the streets. And how unsafe they feel in the halls of their own apartment buildings. And telling how few police officers there are about. But there is too much news on Friday, December 8th. Church of Saint John the Divine in upper Manhattan. "It's the kind of thing that'll still be good in a few days." A view from above the large WNEW newsroom. "This is the first place I've ever worked where there is too much input," observes News Director Jim Gordon, resting back on one of the Ampex 300's in the news production room. "You're looking at what is physically the largest radio newsroom in the city," he says, peering through a soundproof window, down on the operations below. With 58 employees, WNEW news also at one time qualified as one of the largest news outfits in the city. Threatened as the two all-news stations came into being, WNEW's department shrank. "I think if we had stayed the same size, literally, we could have killed one of them." Right now, Jim Gordon proudly regards his as one of the better radio news corps. He says things have been that way since the station started emphasizing news in the late 1950's. The WNEW newsbooth, situated down the hall from the newsroom proper, can accommodate two announcers. 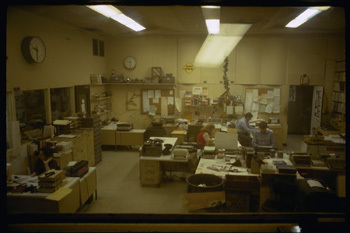 From a button bank on a control board, newscasters punch up their own carts, in contrast to many other stations where a union engineer must control tape play. What will interest one audience very much, may have no appeal whatsoever to the other. Gordon says this can cause minor difficulties sometimes. The FM audience might be interested in Keith Richards' Canadian court appearance, while the AM audience might not be. Gordon doesn't like the word "format" when it's applied to news, but he says he can keep the AM and FM audiences both happy: "we simply do newscasts here." "I'll give you some heresy," he says, launching into a discussion on formats in news. "Most news directors you talk to will give you all those marvelous things about the sanctity of their jobs, and their product. I believe you've got to follow the format of your radio station. I think that any news director who tries to put on news that clashes with what his listeners are expecting is a damn fool. I want my program director at every station I work at to tell me first of all: who their audience is. I want their demographics, I want their psychographics, I want their economic background, and here's where the heresy comes in: The only job of a news director is to make sure they don't turn you off. Because if you're talking to nobody, then you aren't doing your job. So I will give them the kind of stories that these figures show me our audience is interested in." "Will I sometimes tell them something they should know about, even if they don't like it? Of course. But if they're listening to me for the things they want to hear, then i can sneak in the stuff I know they should hear." Gordon says worries about formats don't end at the boundaries of his station. "We are in a tremendously competitive situation here in New York City. I mean, you've got your choice of eighty stations, and they have so splintered the New York City market area...There's one station in New York now playing West Indian music. Exclusively. All day long... Now, when you start to talk about a segmented audience..."
"In the old days, we used to be able to appeal to a much broader spectrum.," remembers Gordon. "We'd have a. youth group -- we had an age group -- all listening to the same station. Now, they've been chopped. off: There's the West Indian audience over there. There's the all-news audience, here. There's the sports audience: gone. And it gets frustrating, because we're appealing to a narrower and narrower segment of brighter and. brighter .people As far as the format's concerned., they know as much about your area as you do. It keeps us going everyday We have a tendency to make a lot more mistakes, I think. They catch us easier." One thing several news directors cannot understand is New York's reputation for viscious competition in news. The WNEW new production room. 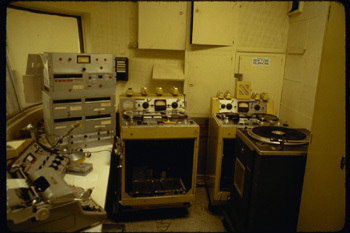 Gordon's team prefers tried and true Ampex 300s and other vintage equipment to the newer Scully and Revox units found in many other news productions rooms in the city. "I'm not supposed to know about this -- no news director's supposed to know -- but on general city hall stuff, the reporters all hold hand's. They've known each other for years, and if one guy gets there late, or he's got a problem with his tape recorder, they go behind the barn someplace and they transfer the stuff. "They shouldn't he doing it, but sooner or later, everybody gets his rear end. saved, and it's not a bad. way to go." "But," says Gordon, his voice rising, "if I thought that my people, on a given breaking story -- and I'm talking we're out in the field now, and there's a hostage situation, or a police chase, and they've got two perpetrators holed up in a building -- if I thought he was helping out the guy across the street, I'd shoot him! That's OURS and it's everybody for themselves. You get the story any way you can, and you don't help anybody. Until it's over, and then, we'll be as helpful as we can be." Gordon believes the mark of a good reporter is his or her background. He says people are hired both for their knowledge, and for the ability to separate a good story from a bad one. "The worst things that can happen to a reporter is for him to second guess. In other words, he'll read page after page of this juicy murder -- 'cause he loves it -- and then he'll get on the air, and talk about a political story. "Hell, he should trust his judgment. If he's interested in the juicy murder story, so are the people he's writing for." 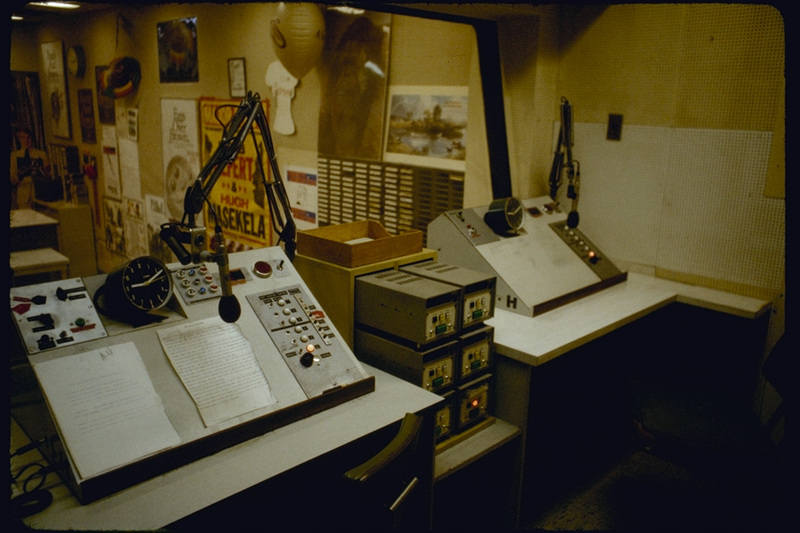 WNEW Picture Gallery - Photographs and brochures from WNEW, circa Fall 1978. WNEW News Format - An example of the typical format used by WNEW news. WNEW News Schedule - A typical morning's news on WNEW. WNEW Sound Bite Lists - A numbered cart list of sound bites ("actualities") from WNEW news. WNEW Datasheet - Station stats on staffing, wires, cart machines, and much more! Associated Press Daybook - An example of the "daybook" feed from the AP, used by WNEW assignment editors. WNEW Announcer History - A partial chronology of personnel at WNEW, from Bill Dulamge's site. WNEW on the Internet - WNEW's web site today. The AM at 1130 is no more, but WNEW-FM lives on, now with a talk format.